Morning all, its been a quiet period for me in gaming land, a combination of summer hobbies, hot weather and the desperate need just to sit and chill out a little means I've done little painting and modelling over the past couple of months. I did however manage to introduce a friend of mine to wargaming, he's a D&D role player normally but has been increasingly interested in picking up miniatures and making terrain so I though it was about times to show him a proper game. Pulp alley is my current favourite set, rules are simple enough to play, the card driven system if random events adds flavour and its perfect for small games. 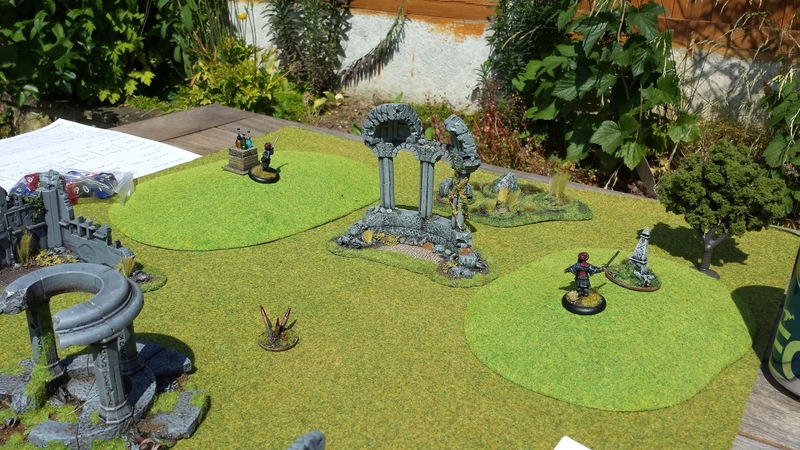 As a big fantasy fan, I worked up a quick bit of fluff and background and after a half hours force selection and board set up we were ready in the garden beer in hand for an epic clash. Our story starts with Akhmed the mad, a sorcerer of great power. He has been raiding Orcish villages for months, his black clad warriors carrying off anything of value. It would appear now he has all he needs to start some great sorcerous plan. 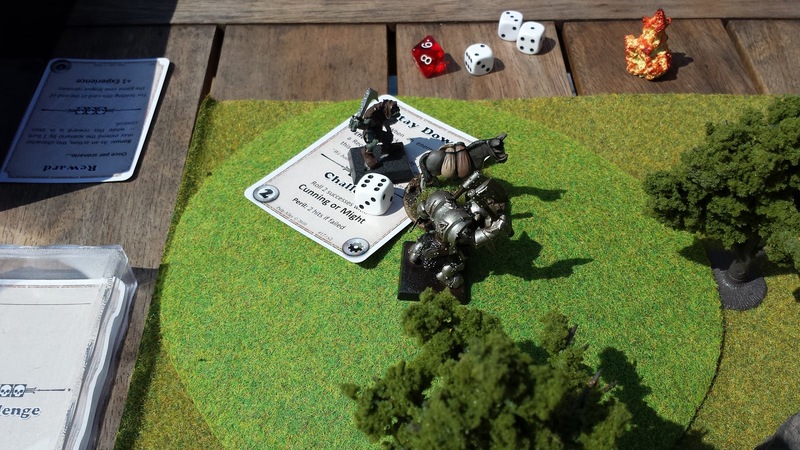 It is now the Orcs decide to strike back, while he is distracted with greater plans the Orcs gather a handful of veteran warriors led by the half ogre Boris. Akhmed's warriors must retrieve at least 3 of the items required for his sorcerous plan and return them to the circle of power in the middle of the board. Akhmed's warriors scatter to collect there items required for the ritual. 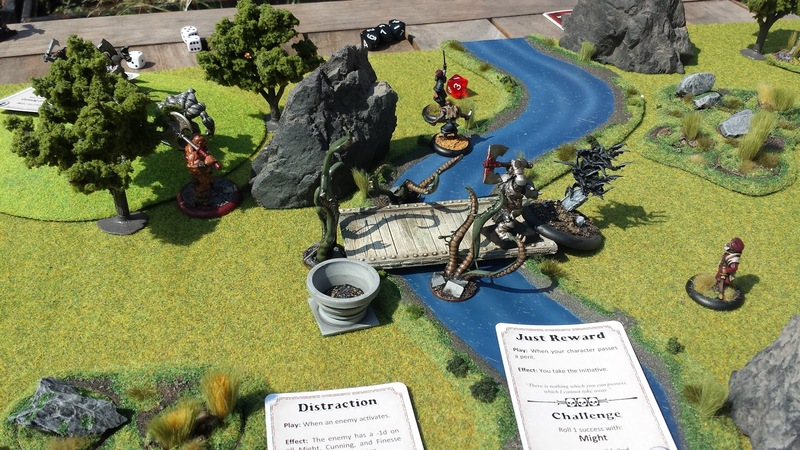 Akhmed summons a beast from the depths and turns the bridge into a perilous area. The donkey sacrifice is more than a match for the orcs and several more join in to help get it under control. 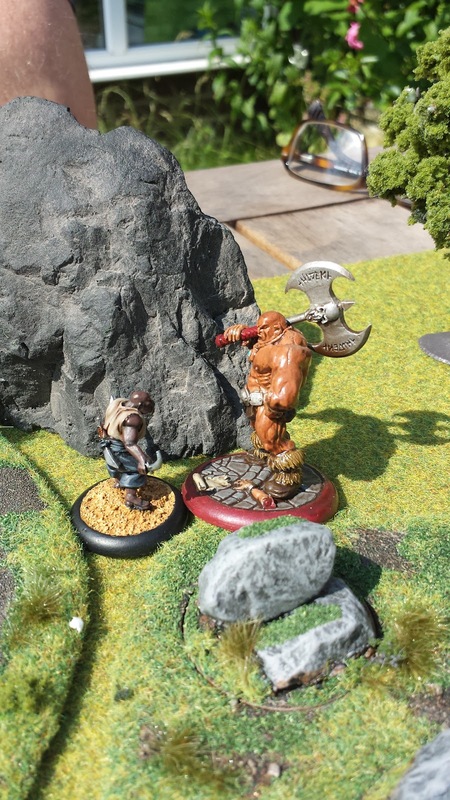 Kazim bravely squares up to "big" Boris the half ogre. The game seems to work really well in a fantasy setting, most of the pulpy cards still seemed to make sense and Neil and I had a great afternoon and I seem to have another fan of pulp alley. Next up there will be some steampunk Alley as another friend of mine got some miniatures from north star recently and wants to put them ton good use.